PRIAM ERP offers an enterprise level multi-channel business system. Just one package controls all aspects of your back-office processes from database marketing, through the fulfilment process to final accounting. It is a fully integrated solution. 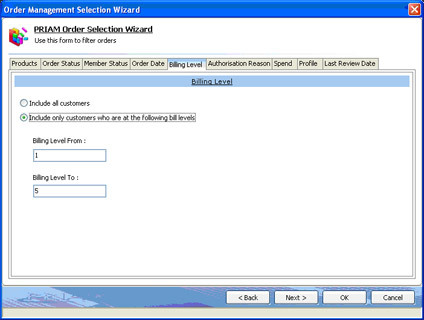 PRIAM ERP is extremely flexible with a high capability for user definition and report writing. It rivals heavyweight packages such as SAP in terms of functionality but at a much more affordable cost and lighter maintenance. 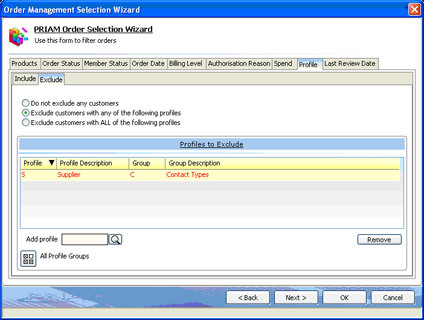 For more information about the main components of the PRIAM ERP/CRM package please click on the titles below. 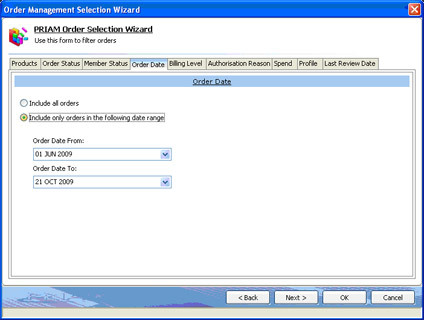 You can take a tour of PRIAM's Order management screens here. 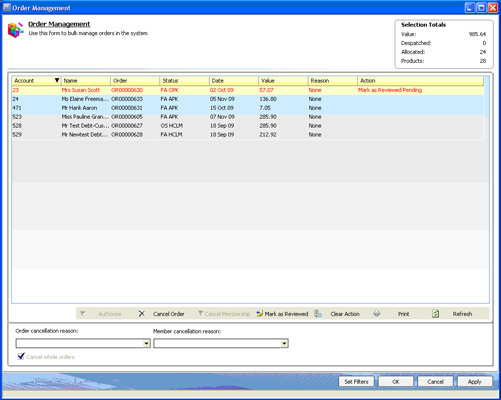 The tabs show the various areas within which restrictions can be set to limit the number of orders returned for viewing. 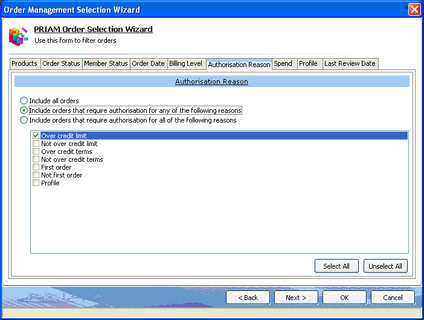 Each area defaults to include the maximum number of orders. You can either work through each area in turn by using the 'Next' button or just jump to those areas in which you want to set restrictions by clicking on the relevant tabs. The image above shows the Products tab. 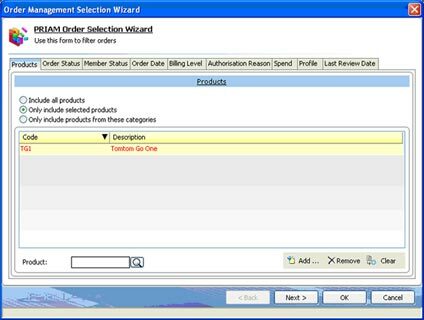 Here you can restrict the number of orders returned to include only those that include specific products or products from specific categories. You can enter a code or use the magnifying glass to find one. Once the code has been entered click the 'add' button to move it into the selection grid. 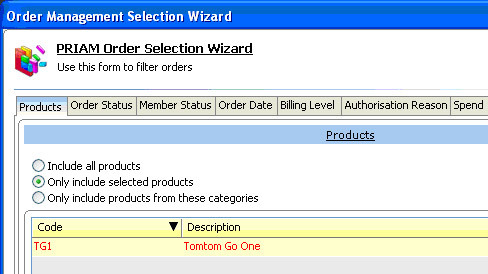 You can choose to include or exclude orders with any or all of a set of statuses using this tab. When you click on any of the 'Include' or 'exclude' radio buttons the selection grid below becomes active (as in the image above) and you can check all of the relevant statuses for inclusion/exclusion. 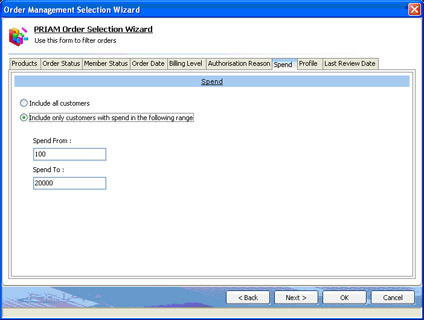 The 'Select All' and 'Unselect All' buttons can be used to speed up the selection process. Note: Selecting all statuses with the 'Select orders with ALL of the following statuses' button active will always return an empty list since an order cannot have every status at one time. In general be very sparing and careful if using the third radio button on either side. 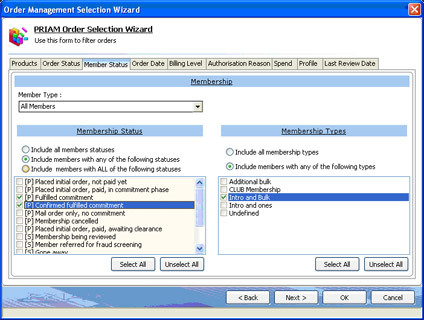 This screen functions in a similar way to the previous screen except for the Member Type drop-down which allows you to select between all, current, and new members. Use this tab to restrict the returned orders to those created between specific dates. If you have billing levels defined you can use this tab to restrict the returned orders to those where the customer falls into the chosen billing level range. Orders can be held for authorisation for a number of different reasons. Here you can restrict the orders returned to include only those that are being held for any or all of the chosen reasons. In this tab you can select a spend range. Customers who have orders and have spent within this range will be included. This tab has two sub-tabs, one to build a list of profiles that customers must have to be included and one to build a similar list to exclude customers with specified profiles. To add a profile to the list, either enter the profile code in the prompt or search for valid profiles. Once you have this code you need to press 'Enter' to add it to your selections. Use the 'Remove' button to remove the current selection from the grid. Note that the exclusion list has priority. That is to say, if you set up the lists to include customers with profile 'A' and exclude those with profile 'B' then customers who have both profiles will be excluded. This tab gives you the option to select orders based on the last review date for the order. 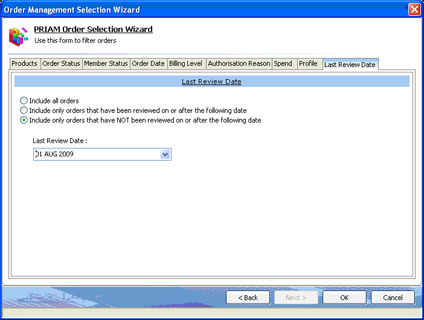 The order management screen opens with the list of orders that fit the criteria set up in the order selection wizard: Selection Totals: various totals for the selected orders are displayed in the top right corner of the screen. 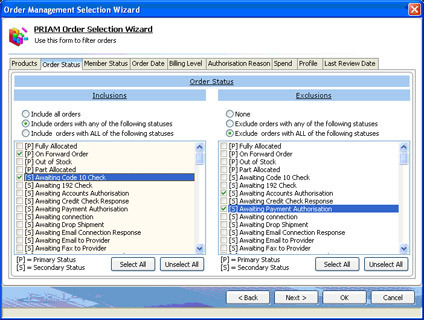 Flexible order processing with multiple interfaces to cover a wide range of options. Enterprise level functionality that covers all areas of stock and warehouse management. Multiple picking and packing options. 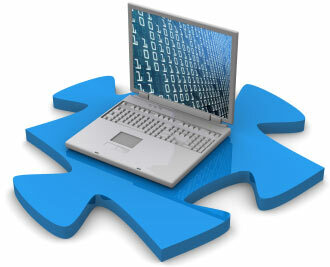 Fully integrated links to courier systems. The simplicity of PRIAM's EPOS solution belies the depth of functionality available. Multiple options that support very large databases and large transaction processing. Full UTF8 support. 4 level campaign structure and a vast amount of functionality for offers and promotions. Flexible reporting that can be scheduled and emailed to cover all areas of the system plus ODBC reporting tools. Sales, purchase and nominal ledgers, cash book and VAT, updated automatically from the ERP system.